All the 3D pen products: the 3Doodler is an innovative product for drawing in 3 dimensions. The heated plastic cools instantly to create original shapes and designs. Ideal for creative hobbies, scrapbooking and the visual arts, this inexpensive and original invention comes with numerous types of refills and accessories to help you get even more creative! Check out the 3D pen and all its plastic refills of different colours and materials here: ABS, PLA, flexible, and all our tips to help you use them for limitless 3D designs. The 3D pen range also includes numerous accessories at different prices to push the boundaries even further. Like a 3D printer that fits in your hand, this pen for drawing in 3D is suitable for all creative hobbies. To help you choose your 3D pen, you can rely on the tests carried out, as well as our certified customer reviews. All the sections devoted to the world of the 3Doodler, including buying guides and product comparisons will help you make your choice. Find all the latest news on the 3Doodler 3D pen exclusively at Makershop3D! 3Drawing is the new expression to use for everything related to the 3Doodler 3D pen. A pleasure to use, thin and light, the pen is easy to handle with two buttons for controlling the output speed of the plastic refills. Just lift your hand and draw any shape in 3 dimensions in the air. When it comes to creativity, the sky's the limit. For an equally original use, you can use patterns to draw on, and then remove the shapes and assemble them to create 3D objects. 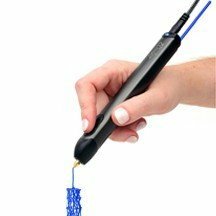 Practical and affordable, a 3D pen is the new tool par excellence, a high-tech item with unlimited possibilities. A pleasure and leisure buy at a great price, it’s an original innovation with a range of possibilities and colours in the 3Doodler filaments refill packs. Moyenne établie par les clients Makershop sur 455 avis.